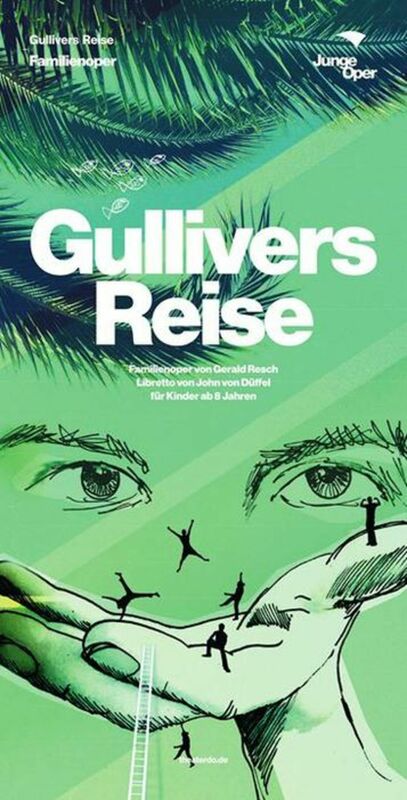 The Austrian composer Gerald Resch has completed the family opera “Gullivers Reise” (Gulliver’s Travel), freely adapted from Jonathan Swift’s classic of world literature “Gullivers Reisen” (Gulliver’s Travels). He was supported in this by the well-known dramatist John von Düffel, who wrote the libretto. The world premiere, undertaken by the Junge Oper Rhein/Ruhr in cooperation with the Deutsche Oper am Rhein Düsseldorf/Duisburg and the Bonn Theatre, will be presented on 21 May 2017 at the Opernhaus Dortmund (Opera House). The performers will include Joshua Whitener as Gulliver as well as the orchestra, opera choir (conductor: Manuel Pujol) and the extras of the Dortmund Theatre under the direction of Ingo Martin Stadtmüller. The producer is Marcelo Diaz, with dramaturgy by Georg Holzer. Follow-up performances of “Gullivers Reise” at the Dortmund Opera House will take place on 23, 25 and 30 May as well as on 7, 11, 16, 18, 20 and 21 June 2017.